E. Howard Hunt was a diehard CIA cold warrior and political operative perhaps best known for his failures. With ice water in his veins and patriotism in his heart, Hunt had a hand in the Bay of Pigs fiasco, was suspected of prior knowledge and complicity in President John F. Kennedy’s assassination, and most famously bungled the Watergate burglary, which brought down the presidency of Richard Nixon. Few people, though, would suspect that Hunt also possessed a bit of poetry in his soul. Between toppling Banana Republics and playing hardball with the Russians, Hunt was the author of more than 40 adventure and espionage novels. 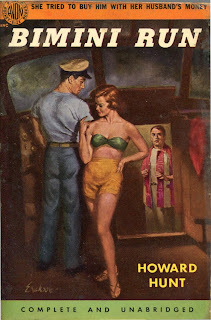 One of his best-known works, Bimini Run (1949), combines action, concision, and an emotional dimension which in a scant 158 pages has the reader careening between characters and situations, and their entangling and final unwinding. Leading man Hank Sturgis is a humble guy who’s seen a lot. A former football star, law student, and wounded World War II veteran, he’s now a drifting gambler struggling to stay solvent. When a bookie welshes on a bet, and then the nightclub where he works goes under, Sturgis is forced to sign on as first mate and man Friday to a pair of wealthy pleasure-seekers who’ve chartered a fishing boat for an extended expedition in the Caribbean. The husband, Clay Crawford, is a drunken bully who can’t seem to get over the insecurities that inheriting too much money have cursed him with. Leslie, his wife, was born poor; but she’s smart, ambitious, and beautiful. Captain Engstrom, master of the Velva, is in the book to clash with Crawford on various occasions and to pilot the boat so the other three can interact. Trouble begins when Crawford confuses catching big fish with virility and his wife begins to show an interest in Sturgis. Instead of dousing these fires with water, the players use alcohol. 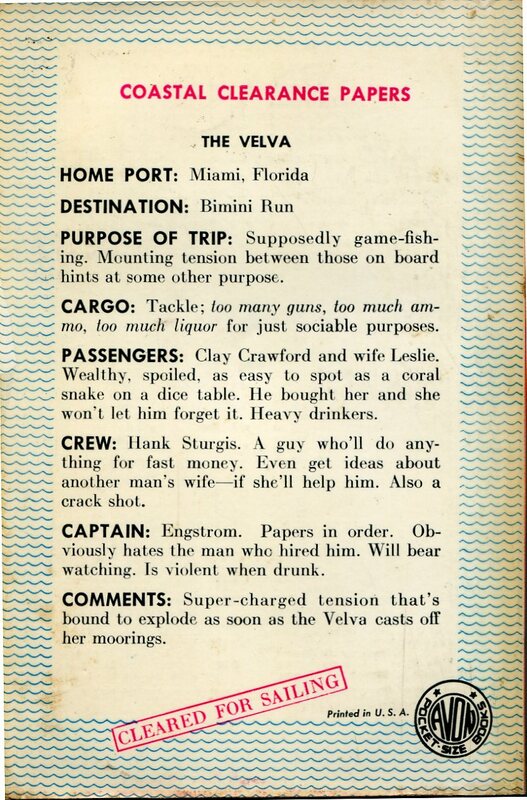 Bimini Run possesses the decorating scheme of an Ernest Hemingway story--deep-sea fishing, too much alcohol, and a couple at odds over a husband’s machismo. The heart of the novel also has the familiar Hemingway themes of generational issues and the importance of maintaining a code of honor. Hunt has fashioned a story of youth dissatisfied with mainstream life after returning home from war; but instead of setting it in Paris, he placed it in the world of racetracks, gambling houses, and the idle rich. While hardly a reprise of The Sun Also Rises, in Bimini Run Sturgis, like Jake Barnes, lives by a code of honor that keeps him loveless, alone, and wary of intimacy. Hunt continues to crib from Hemingway with the theme of man vs. nature, as well. Crawford is on a quest to hook a manta ray fit for the record books. While Crawford is up to his eyeballs in booze, fistfights, and fishing, wife Leslie begins to look at Hank as more than just hired help. Bimini Run is pure pulp entertainment, but Hunt deserves some credit for preventing Hank and Leslie from falling into the cliché of world-weary and star-crossed lovers. There’s no self-pity in Sturgis and how his life went from promising to slightly desperate. As for Leslie, she’s a girl who can look out for herself at the very least. Sturgis had known poor girls with intelligence and rich girls who could barely read a comic strip. Leslie was something new--the once-poor and intelligent; the new-rich with brains. He found the combination disturbing. It’s not that Sturgis doesn’t think he could handle a woman like Leslie; he’s onto her from the outset. He knows her motives might at the moment be pure, wanting him to rescue her from a brute of a husband, but they are not enduring. Sturgis “resents the admiration he had begun to feel for her,” because she’s calculating and doesn’t possess boilerplate scruples as he does, and therefore cannot be trusted. “He knew that she made her own rules and broke them when they grew too confining,” writes Hunt. Leslie makes a play for Sturgis, but his independence and determination to make his own way obviate the temptation of a beautiful woman with money. He and Leslie come to terms in an exchange that shows the Brown University-educated Hunt had his head fully in the game of composing potboiler prose with wit and brevity. 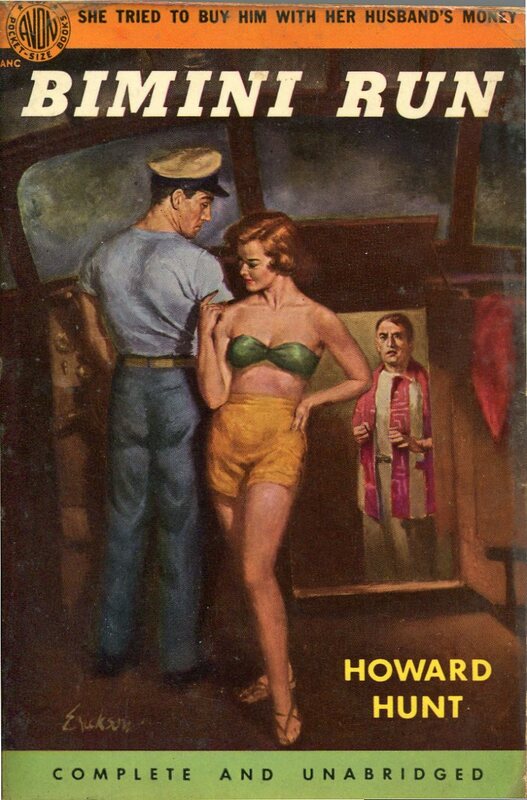 One wonders what E. Howard Hunt would have done with his art if he’d spent more time writing rather than working in the shadows to keep America safe for democracy. The world most likely would’ve stayed the same without his efforts, but his writing, as professional and sound as it is, might’ve brought him a greatness that his career as a spy never came close to offering. Fantastic review. I actually really like the Hunt books (although admittedly, a great deal of that comes from a fascination with his crazy life). I didn't even know this one existed. Thanks! Always been curious to sample this guy's prose. He sounds better than I expected. watergate tell: the name "Sturgis"